I've just spent a minute or so deliberating the date, if it's wrong, I apologise, but gosh aren't the weeks whizzing by? Well, you'll be pleased to know the weather has been glorious today.....only problem.....I haven't finished my jumper! I've done a little more since taking the picture, and only have the cap of both sleeves to do and then sew it up. It feels really soft and warm and I'm soooo looking forward to trying it on (and hopefully it fitting!). The yarn is Life Chunky by Stylecraft. It is a wool acrylic mix and is called Nutmeg Marl, a kind of grey/blue/mushroom colour......are you picturing it? This yarn is super soft and really reasonable. There is also something to be said for the fact it is machine washable so won't spend months sitting at the bottom of the wash basket waiting to be hand washed. This has been a great project, just the right amount of sitting on the edge of my seat, learning new skills, 3 needle bind off, picking up new stitches, wrap and turn....and even the knitting itself, as I have done the whole thing continental style. I have the sewing to go and will use mattress stitch as everyone rates it so highly. I take it I should join the sleeves to the body and then sew the sides and the sleeves up.....is there an order to do things? Anyway, despite not having a jumper to wear, we have been to the beach this afternoon for a blow around. It was extremely cold and windy. 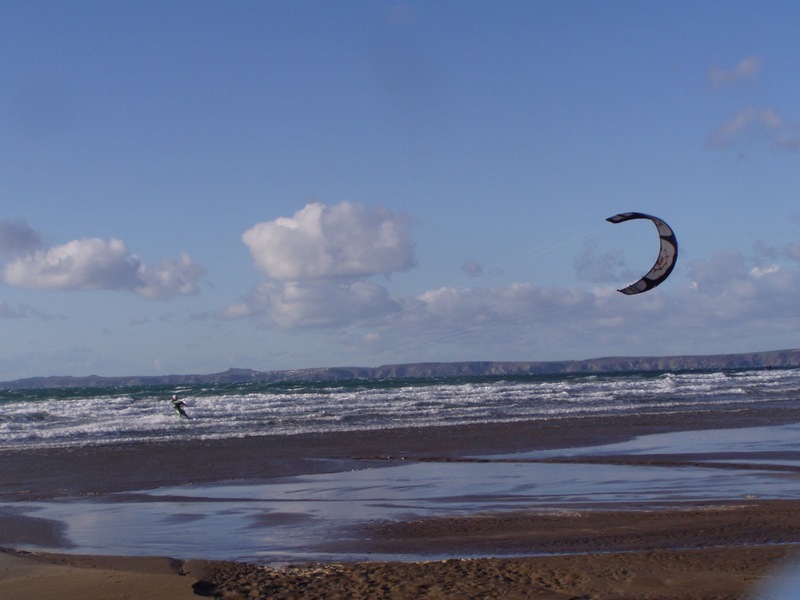 Just look at this clever bloke on his surfy-kite thing. I am looking forward to supper, bathed and sleeping children and sitting down with my cup of tea to check out all the other projects. If you want to see other Year of Project work, check the ravelry page here. Thanks as ever for all your helpful advice. I have blocked the body of my jumper and it is behaving a lot better now.........just have to get on with the last stretch and the sewing up! I know exactly what you mean about the time flying by Faith...I make my plans each week but never manage to complete my list! 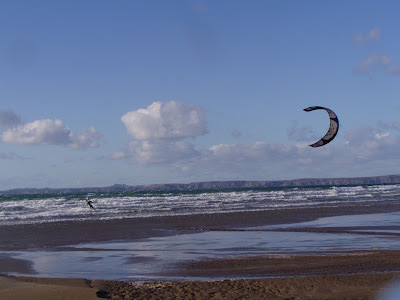 Ooh, that's a very brave man on his surfy-kite thing there...Very adventurous! Your jumper is looking lovely and I can't wait to see it finished and a photo of you wearing it. Your jumper is looking great and you won't find until you are wearing it and I'm still betting if fits. It must have been fairly windy for that guy lol, brrrrr I don't fancy it. Fabulous picture of the beach, enjoy yourself, maybe next time we'll get to see you styling in your sweater. That jumper looks great - I'm in awe of your knitting prowess! Now, I'm just crap when it comes to picturing knitty-things-finished so to me, it is a mystery. Good sized hood, I reckon!! You are so close with the jumper! I cannot imagine the time that goes into that! Your jumper is looking so great, can't wait to see it modeled. Well done with the continental style knitting, I can knit like that if I make myself but always end up going back to my normal way. Thats the order I have used when sewing up knitting but I don't know if it is the correct way!! Great beach photo. Hope you have a great week. It's looking great, and I think it is really cool that you are learning and practicing so many techniques with this project! The jumper always looks so curvaceous in your photos. It looks as though it will hug you in all the right spots! 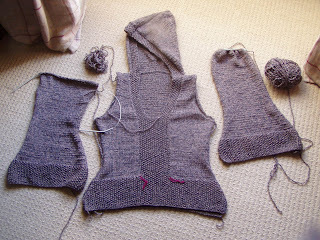 I've never set sleeves in a knitted garment, but I've sewn t-shirts, and it's definitely easier to set the sleeve before sewing the side seams. Mattress stitch is much the best choice - it's like magic to pull on the yarn and watch the two pieces become one. Gorgeous, gorgeous ocean and very brave surfy-kite dude! The water must be icy. Terrific progress! You are so brave to take on a seaming project. I have never seamed anything yet--so no advice from me. But did you not love that 3 needle bind off? I am always excited to get to use it! (I am nerdy like that!) :) Your day at the beach picture does look a bit blowy--we are expecting quite warm spring time temperatures tomorrow-but then back to chilly and rainy for the weekend. Our weather has a way of teasing us like this for months!